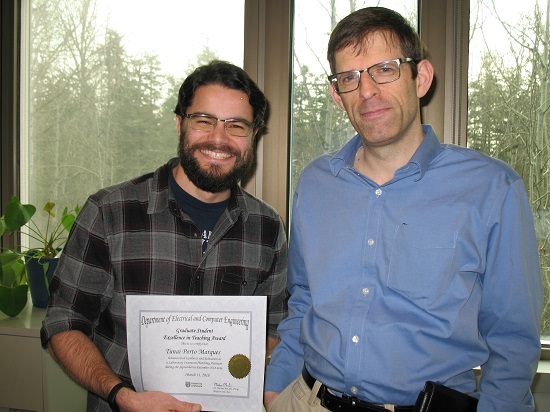 Mr. Tunai Marques is the recipient of the Graduate Student Excellence in Teaching Award at ECE for the Fall 2018 term. Congratulations to Mr. Tunai Marques. He is the recipient of the Graduate Student Excellence in Teaching Award at ECE for the Fall 2018 term. Tunai was the Lab TA for an ECE 355 Microprocessor-based Systems lab section that term. Tunai is in his second year pursuing a PhD degree in the area of image processing. His supervisor is Dr. Branzan Albu. The award recipient is selected by the department's Chair. The award is given each term to the teaching assistant who received the best evaluation from students or made valuable impact on student learning. The department would like to thank Tunai for his contribution and outstanding effort.